Discover the mystery behind Lut desert and the hottest place in the earth and explore fabled capitals of ancient empires with our expert trip Leader, well-spoken and experienced in sharing his native land with travelers. Stroll in magnificent Persian gardens that trace their design principles to the days of Cyrus the Great. Discover the mystery behind Lut desert and the hottest place in the earth. Mingle with local residents and vendors in Iranian colorful markets. Discover Pasargadae and Persepolis, cities of the Achaemenid Empire that rank among the world’s greatest sites of antiquity. This morning we take you a World Heritage Site, the lavish Golestan Palace. Built during the Qajar Dynasty that rose to power in the late 1700’s, this fabulous walled complex is centered on a landscaped garden with tranquil pools. As of today, there’s no bank or money exchange but the place has been delicately restored into a Dizi Sara and a tea house where tea comes in thin waist cups and along with sugar canes.Time permitting, we can walk around Tehran Bazaar, few steps far from Golestan Palace. Continue along the Bazaar route, we go to the Timche Akbarian. Timche Akbarian dates back to almost 260 years from the Qajar era when its main purpose was for exchange and gold. Later it was developed into the first bank of Iran ran mainly by Jews who were the prominent residents of Oudlajan neighbourhood. Today you’ll go to see National Museum of Iran which is an institution formed of two complexes, including the Museum oAncientnt Iran and Islamic Era. Later we take you to the Mehrabad airport in Tehran for your included flight to Kerman. Today on the way to Shahdad you will stop in Mahan. Meet Sufis who have travelled a long way to pay homage to their Sufi master Shah Nematollah Vali in his shrine. Get relax in Shahzadeh Garden and admire a great example of Persian gardens that depicts a high contrast between a green garden and a harsh desert at the background. After lunch, we’ll continue to Shahdad is located at the edge of the Lut desert, for visiting a wonderful scenery of desert in Kaluts. Kaluts are the wonderful sandy shapes created by wind or water erosion. They are the most beautiful natural phenomena. They are unique and can’t be found in any desert of the world. You will stay this night in the camp and be sure that you will gaze the night sky till you sleep. After breakfast, we will drive to Gandom Beryan. The “ Gandom Beryan “is located 80 kilometres Shahdad, the Volcanic area is covered with black volcanic rocks that cover the same intense heat rising in the region. This region is the lowest of the Iranian interior region and this is another reason for the intense heat. Plain “Gandom beryan” that is an area of 200 km and 150 km wide No living thing is not life and environmental conditions in such a way that there is no planter animal. Even the carcases of dead animals and abandoned in a wheat grill, and not decomposed by heat, the sun dried heat but just are. It is also possible in this area, even bacteria will not survive. In the afternoon you will come back to Shahdad camp. Today we’ll drive to Shiraz and leave the desert by its mysteries. We will have some stop in our way to visit Bakhtegan and Maharlu Salt lakes and Sarvestan Sassanid Palace. The lake is located in altitude of 1460 meters above the sea level and its water is very salty. Maximum depth of this lake is 3meters so its amount of evaporation is high and this cause a part of lakebed to be covered with a layer of salt, of course the existence of chalky sediments of sachun formation and two salt domes in the east of the lake have considerably effect on its extreme saltiness. After breakfast will start your full day tour of Shiraz. At first, you will visit Nasir-al-Mulk Mosque (Pink Mosque) few steps far from Vakil Bazaar. It built by the order from one of the lords of the Qajar Dynasty, Mirza Hasan ‘Ali Nasir-al-Mulk, it took 12 years to complete in 1888. Its interior reveals a magnificent masterpiece of design with stunning colours. This is a space where light and worship intertwine. The mosque comes to life with the sunrise and colors dance throughout the day like whirling dervishes. It reflects on the ground, walls, the arches and the towering spires. It even reflects on the visitors as if a colourful ball is hit by the first sun ray and explodes to thousands of butterflies all around. Then you will visit Karim Khan Citadel. Built during the Zand Dynasty. Also you can visit Holy Shrine of Shah-e-Cheragh. Shah-e-Cheragh is the most important place of pilgrimage within the city of Shiraz. The tombs became celebrated pilgrimage centres in the 14th century when Queen Tashi Khatun erected a mosque and theological school in the vicinity. Ahmad (Shah-e-Cheragh) came to Shiraz at the beginning of the third Islamic century (approximately 900 AD), and died there. During the rule of Atabeg Abū Sa’id Zangi (1130s AD) of the Zengid dynasty, the chief minister to the monarch by the name of Amir-Muqarrab-al-din Badr-al-din built the tomb chamber, the dome, as well as a collonaded porch. End your day in Shiraz on a tranquil note in the lovely garden tomb of Sa’adi and tomb of Hafez, two of our most outstanding poets to feel the taste of Persian Literature. Hafez is one of the great poets who impressed everyone with his mastery. His poems give us a special feeling and the peace in his tomb is really outstanding. Sa’adi is a poet, philosopher and mystic who is known as the father of an alternative tourist. About seven previous centuries he travelled to different countries and cities. Then he collected all his experiences in verse and Rhyme prose in two books named Boustan and Golestan. These two books give you Lots of inspiration and information. We will get a chance to pay homage to tombs of these great poets. We will have some stop in our way to visit legendary city of Persepolis, former capital of Darius the Great and founded in 512 BC. There was no more impressive construction in the ancient world, except perhaps Karnak in Egypt. Alexander the Great entered Persepolis in January 330 BC and then committed an uncharacteristic act of wanton destruction that still mystifies historians today, burning the mighty city to the ground. Though a shadow of its former self, the soaring pillars, terraces and sculptures of Persepolis still remain, but probably most impressive are the bas reliefs which line the site, telling the story of ancient governors and kings that came to Persepolis to pay tribute to the Persian Emperors. 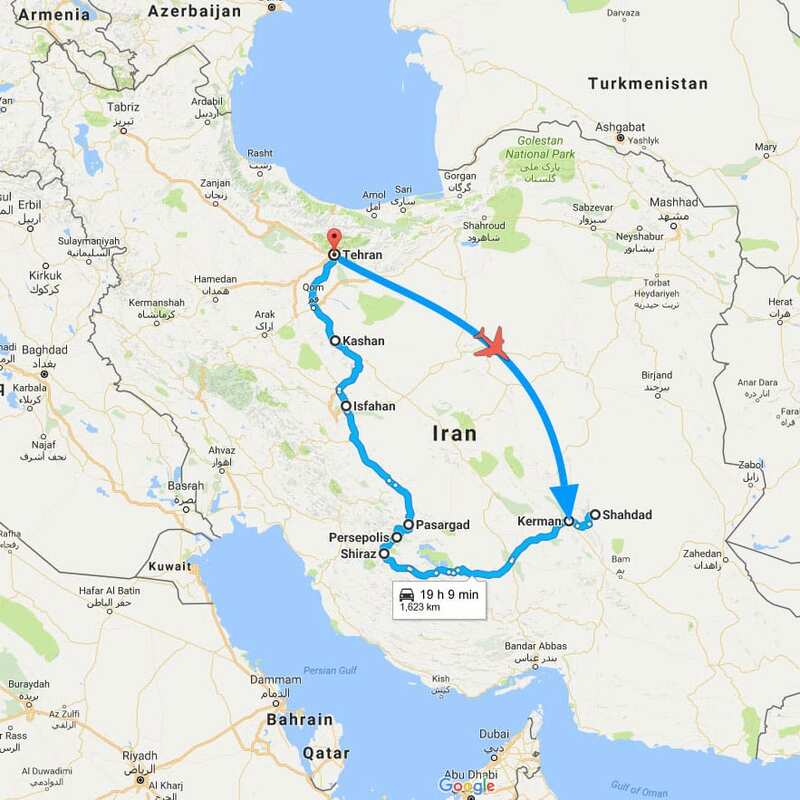 From here we will drive a couple of miles to Naqsh-e-Rustam, the Necropolis where Darius and his successors are buried. Carved into the side of a cliff, the site is extraordinary in its magnitude and sheer ambition and does not disappoint even after the impressive Persepolis. Continue to Shiraz and check in to our hotel. Then visit Pasargadae, UNESCO World Heritage Site, tomb of Cyrus the Great and former capital of the Achaemenid Empire. We will spend some time exploring the site and though not as striking as Persepolis, there is a great viewpoint where we can look over the site and the surrounding area. Continue to Isfahan and check in to our hotel. At first, you will visit Masjed -e Jamé is another masterpiece of Iranian architecture, covering nearly 5 acres in the heart of this historic city. This is one of the oldest congregational mosques in the country, and its construction and embellishment over the past twelve centuries illustrate a number of important periods in Islamic architecture. Then your exploration continues in Imam Square. This 17th-century site is one of the largest public spaces in the world. Here in the square, you’ll visit the 17th-century Shah Mosque, revered as a masterpiece of Islamic architecture and easily recognised by its magnificent tile-work and soaring cupola and minarets. In the Ali Qapu Palace, you’ll marvel at its beautiful music rooms and the balconies where Safavid kings would sit to enjoy the polo matches unfolding in the square below. You’ll end your day exploring the Qeisarieh Bazaar that surrounds Imam Square. With hundreds of local vendors that specialise in traditional arts and crafts, it’s a wonderful place to shop for pottery, enamel, jewellery and delicately inlaid board games. Walking through the bazaar we get to the Mosque of Mir Emad, which we will visit along with the Masjed-e Jame. Later, leaving Kashan behind, we’ll drive to IKIA airport. Meals: 10 breakfasts, 0 lunches, and 0 dinner. In your trip we use private AC Middle Bus or Bus throughout this tour, subject to the final size of the group. We run regular small-group departures on this tour. All departures are guaranteed to run if a minimum of 5 travellers is reached. If we do not reach this minimum number (which happens very rarely), we will offer you the option to either pay a small supplement to do the tour exactly as planned, to change your date, to transfer to another tour, or we will provide you with a full refund. Departure dates and prices are listed on our website and in our brochure. Please check the website for the most up-to-date prices and any special offers.